Medical staff are sterilized before entering the isolation unit at a hospital in Bundibugyo, western Uganda, on Aug. 17, 2018, where there is one suspected case of Ebola. A U.N. employee in eastern Democratic Republic of the Congo has tested positive for Ebola, the first such incident during the current outbreak, according to the head of the U.N. peacekeeping mission. "I am writing today to inform you that my leadership team and I have regretfully just received news that a U.N. colleague based in Beni has tested positive for Ebola and is now receiving the necessary medical treatment," Leila Zerrougui wrote in the letter obtained by the Reuters news agency. Zerrougui said the employee had not been to work for several weeks and that officials were tracing the person's contacts. The news came after health officials warned that the rate of new Ebola cases had more than doubled since September. A Red Cross volunteer explains measures to prevent infection with Ebola to inhabitants, on Aug. 17, 2018 in Butugo, western Uganda, near the border with Democratic Republic of Congo. The sharp rise has health officials concerned that the situation in eastern DRC Is at a crossroads. Either the outbreak is getting worse, or local residents are finally responding to education campaigns and government edicts and are no longer resisting health workers. The death toll stood at 125 as of Friday, out of 201 reported Ebola cases (166 confirmed and 35 probable), according to the DRC's health ministry. This outbreak, the country's 10th, initially was reported Aug. 1. "The fact that we see more cases could also be a positive sign," said Tarik Jasarevic, a spokesman for the World Health Organization, speaking by phone from Geneva on Thursday. "… We have seen in the past that sometimes people would hide sick ones or would actively run away" from aid workers charged with tracing the contacts of infected patients — a step essential to curbing the deadly disease's spread. 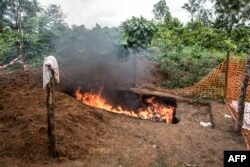 Health workers burn mattresses used by patients with Ebola virus, on Aug. 21, 2018 in Mangina, near Beni, in the North Kivu province of the DRC. But insecurity is complicating the health community's response in the outbreak's epicenter in the North Kivu region, where more than 100 armed opposition groups operate, and more than 1 million people have been displaced. The jump in reported cases follows a Sept. 22 armed attack in Beni, a town near the border with Uganda and the center for aid efforts. Eighteen people died, including 14 civilians, according to the army. Jasarevic said WHO health workers were forced to stay indoors for two full days following the attack. "Operations were hampered by the insecurity," Jasarevic said. "… And not only because of the [health] teams not being able to go out, but also because of the reaction of the population." A military truck of the United Nations Organisation and Stabilisation Mission in the Democratic Republic of the Congo patrols on the road linking Beni to Mangina on Aug. 23, 2018 in Beni, in the DRC's North Kivu province. Other violence has impeded aid work in the region. 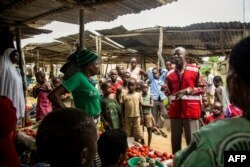 Last week, three Red Cross volunteers on an Ebola burial team were attacked and injured while conducting their duties in the northeast city of Butembo, according to the DRC Red Cross. It said, in a statement, that two of the volunteers were being treated for serious wounds. The Red Cross statement reminded people that the body of an Ebola victim is highly infectious and requires careful handling. The Ebola virus spreads through contact with bodily fluids. In addition, some families have refused to allow aid workers to check on and treat potential patients, and other victims have fled, raising the possibility that the virus could spread to neighboring Uganda, Rwanda and South Sudan. Jasarevic said local people's "reaction to the Ebola response is sort of linked to their reaction to the general insecurity, basically thinking that if all these authorities, including international actors, are not able to provide security, how it would be then possible for them to try to control the outbreak?" 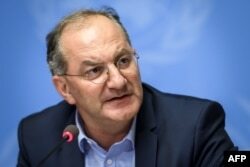 FILE - Peter Salama, head of the World Health Organization Health Emergencies Program, attends a press conference following an International Health Regulations Emergency Committee meeting on an Ebola outbreak in Democratic Republic of the Congo, May 18, 2018. The WHO initially had predicted the disease possibly could be brought under control within three months, thanks in part to a vaccine that has proven effective for people who have been exposed but haven't shown symptoms, and new treatment drugs for people who have contracted Ebola. But Peter Salama, WHO's executive director of the health emergencies program, said Thursday that the response timetable needed revision. "We anticipate that now we'll be looking at least another three or four months in order to really stem this outbreak, with a strong focus again on Beni and surrounding areas," Salama said at a Geneva news conference. This report originated in VOA's English to Africa service. VOA's Carol Guensburg contributed.